Android users can chat now with their Facebook Application. 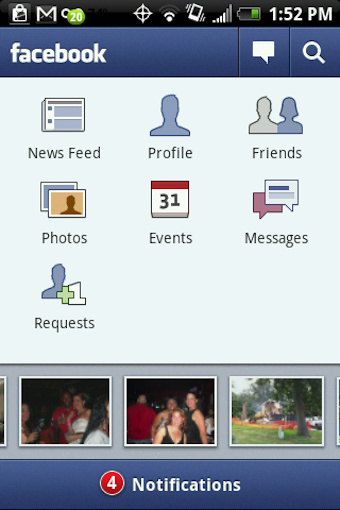 Facebook App for Android has been updated with its almost completely functional feature of Facebook Chat. The official facebook app now has a Chat interface that presents open chats up at the top so you can see who’s around at a quick glance. This means you no longer have to use third party apps, like Trillian for Android, that used to be the only way you could chat on the go. Previously, the Facebook application for iOS was the only one to include this feature, according to Erictric.com. Another update to the old version is that the new app now has push notifications alerting you every time you receive a new chat. This is especially cool because it means you can get a message even when the application isn’t being used. You can have your phone flash, ring, or vibrate any time you get a friend request, message, and event invite. The push notifications can also be set to alert you anytime you get messages, comments, and wall posts so you don’t have to open the app to see what people are saying to you. Developers say there have also been some bug fixes in this updated app, so if you have a Droid, make sure you download the update now.